As long as I can remember, I’ve been fascinated by reptiles and amphibians. Most of my earliest childhood memories involve wandering the woodlands and wetlands of New Jersey and returning home with a muddy complexion and a pet frog in my pocket. I never imagined that twenty years later, I would find myself racing around the world searching for outbreaks of emerging amphibian diseases and building a frog rescue center in Honduras to save frogs from extinction. It’s easy to become overwhelmed by the increasing challenges to protect biodiversity and wild places from habitat loss, diseases, pollution, and climate change, but I also feel that there has never been such an important time to work in conservation. My involvement in herpetological conservation began in 1997, when I volunteered to join a reptile and amphibian biodiversity survey in Hong Kong and mainland China with The Conservation Agency. After spending a month bushwhacking through tropical river valleys, exploring small uninhabited islands, and catching my first bamboo viper, I quickly learned that fieldwork was in my blood. During this trip, I became good friends with Dr. Skip Lazell, President of The Conservation Agency, who soon became my mentor. He helped me write my first publication and invited me to join him on three more expeditions to Hong Kong as well as to Kenya, New Caledonia, and the US Virgin Islands. In 2006, I stumbled across an opportunity to join a survey team in Honduras with Operation Wallacea, working to document reptile and amphibian biodiversity in Cusuco National Park, a cloud forest threatened by illegal logging and poaching. I worked with a small team of herpetologists spread across this forest and in just six weeks, we discovered nearly thirty species not previously documented in this region. While preparing to return to Cusuco in 2007, I read several IUCN Red List assessments of frogs in Honduras that were disappearing for unknown reasons. A couple weeks later, I attended a course on amphibian disease monitoring provided by the US Fish and Wildlife Service, and one of the instructors, Katy Richards-Hrdlicka, taught us how to sample frogs and tadpoles for chytrid fungus. 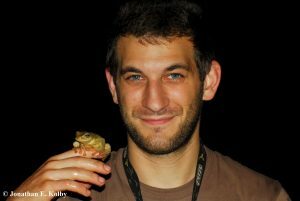 I previously knew very little about amphibian declines and the global emergence of amphibian chytrid fungus, and after this class, I decided to immerse myself into this alarming conservation issue and investigate whether chytrid fungus might be driving the decline of endangered frogs in Honduras. After this class, Katy became my mentor in all things chytrid and taught me how to prepare my first grant proposal to conduct fieldwork. I was incredibly excited to be awarded funding by the National Geographic Young Explorers program, and together with support from several additional institutions, my research ideas were suddenly catapulted into reality. In 2007, I returned to Cusuco and sampled every amphibian I could find for chytrid. I was alarmed to discover that frogs throughout this forest were positive for chytrid, and the highest rates of infection were detected among the endangered species which had been reported to be experiencing dramatic population declines for unknown reasons. My research showed it was time to take action, and I decided to do everything I could to ensure these frogs would not silently disappear due to chytrid. 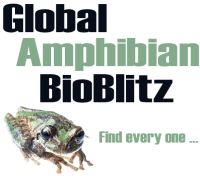 With help from Amphibian Ark, I was introduced to Jessi Krebs at Omaha’s Henry Doorly Zoo and Aquarium in the USA. Jessi expressed a strong interest in helping me develop a conservation program. With his support, the Honduras Amphibian Rescue and Conservation Center (HARCC) was quickly becoming a reality. I continued returning to Cusuco to study long-term patterns of chytrid infection in wild amphibian populations and measure environmental conditions in order to help develop captive husbandry protocols. Based on five additional years of field data, I decided to focus the HARCC frog rescue operation on three endangered species which appeared most likely to face extinction in the near future: the Cusuco Spike-thumb Frog (Plectrohyla dasypus), Exquisite Spike-thumb Frog (Plectrohyla exquisita), and Mossy Red-eyed Frog (Duellmanohyla soralia). In consultation with Jessi Krebs and Brandon Greaves at the Henry Doorly Zoo, we developed the strategic framework for HARCC: a head-start and reintroduction effort to supplement the vulnerable populations of adult frogs breeding in the wild in Cusuco, with a simultaneous captive breeding effort to establish the first captive assurance populations in case these species suddenly crashed. In 2013, I formed a partnership with Lancetilla Botanical Garden and Research Institute in Tela, Honduras, where I was granted permission to establish HARCC Headquarters. In 2014, HARCC construction officially began with the arrival of two ocean shipping containers that we would transform into frog rescue laboratories. After numerous trips to Honduras accompanied by highly skilled staff from the Henry Doorly Zoo, Phoenix Zoo, USA and Atlanta Botanical Garden, USA, I’m so excited to announce that HARCC is almost ready to open! 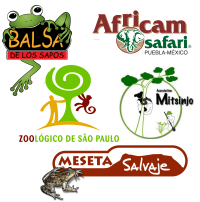 When fully operational, HARCC will protect three amphibian species from extinction, offer opportunities for Honduran university students to gain hands-on experience in conservation, and establish a model conservation framework that can support other amphibian rescue programs in Latin America and worldwide. With every great conservation challenge comes an opportunity for innovation and capacity building, and I couldn’t be more excited to watch HARCC develop and seek new ways to help protect the future of amphibians. Working in conservation has been incredibly fulfilling and equally challenging. I dedicate a great deal of my “free time” to sharing my work with new audiences in hopes of inspiring others to help protect nature. While working on my PhD to understand the global spread of chytrid fungus, I also learned about the importance of using social media and science outreach to better communicate with the public about my research, why I do it, and why they should also care. To share information about HARCC, I helped create a HARCC YouTube channel with video updates, a frog rescue website, and social media accounts on Facebook, Instagram, and Twitter. In 2016, I started working with Katie Garrett, an amazing science videographer from London, and we created a video about HARCC for National Geographic. I’ve been incredibly impressed with the public’s level of engagement and interest in HARCC, and it continues to encourage and inspire me. I recently completed my PhD at James Cook University in Australia, where I studied the global spread of chytrid fungus. During this work, I discovered the first record of chytrid in Madagascar, evidence of chytrid spreading in rainwater, and exceptionally high amounts of chytrid being spread by the international wildlife trade. For my day job, I’m currently working for the U.S Fish and Wildlife Service as a CITES Policy Specialist where I help ensure that the global trade in animals and plants does not cause their extinction. It’s easy to become overwhelmed by the increasing challenges to protect biodiversity and wild places from habitat loss, diseases, pollution, and climate change, but I also feel that there has never been such an important time to work in conservation. The decisions we make over the next few years will impact generations to come, and I feel lucky to be able to contribute my efforts during this critical time to protect biodiversity and global health. In the future, I hope to combine my skills in science and policy to develop international systems that will reduce the spread of chytrid and other emerging pathogens through the wildlife trade, giving the world’s wildlife a better chance of survival.